Air Compressors Direct Lists Best DC Compressors. Recommendations Based on Sales History and Expert Reviews. DC air compressors are reliable, compact compressors powerful enough to inflate off-road & military vehicle tires. If you need strong, reliable air supply on the go, a DC compressor will be perfect for you. Today Air Compressors Direct announced its recommendations for the best DC air compressors. "DC air compressors are reliable, compact compressors powerful enough to inflate off-road & military vehicle tires," said Steve Robbins, resident product expert at Air Compressors Direct. "If you need strong, reliable air supply on the go, a DC compressor will be perfect for you." According to Robbins, you'll have a difficult time finding a DC compressor on the shelves of an ordinary big box retailer. However, AirCompressorsDirect.com, isn't your ordinary retailer. The online superstore specializes exclusively in air compressors and carries almost 20 DC air compressors from the leading national brands. The online retailer combined retail prices, recent sales history, customer reviews and personal insight to generate its final recommendations. 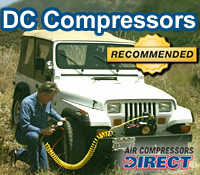 Once the dust and data settled, only 3 DC compressors sold by AirCompressorsDirect.com were given its prestigious "Recommended" status. In addition, Robbins personally wrote online reviews for each DC compressor, explaining why the company recommended it. By providing the recommendations and reviews, Air Compressors Direct hopes to arm shoppers with enough ammunition to pick the perfect DC air compressor for their needs. Power Equipment Direct operates 11 niche online superstores. In addition to AirCompressorsDirect.com, the Bolingbrook, IL-based company operates ChainSawsDirect.com, ElectricGeneratorsDirect.com, LeafBlowersDirect.com, LogSplittersDirect.com, MowersDirect.com, PressureWashersDirect.com, SnowBlowersDirect.com, SumpPumpsDirect.com, TillersDirect.com and WaterPumpsDirect.com.